You are invited to participate in a workshop to share your views on how Sandyford could be improved as a district. We value your thoughts on what improvements would make Sandyford a better place to work and live. In particular, we would like to hear from you about the challenges Sandyford faces (e.g.) mobility, sense of community, amenities, connectivity, etc. We want to make Sandyford a world class destination to work and reside, a vibrant community of businesses and residents with a unique identity, and a place where living, working, and shopping and spending leisure time is attractive, easy and positive. Your participation will provide invaluable insights that will help us develop a new “Smart Sandyford” programme of work to deliver more value to our community. Smart Sandyford is a joint initiative of the Sandyford Business District and Smart Dublin that seeks to use cutting-edge technologies to solve some of the challenges we face. From mobility issues, to environmental concerns, to building a sense of community, innovative technologies can help us overcome some of today’s problems. 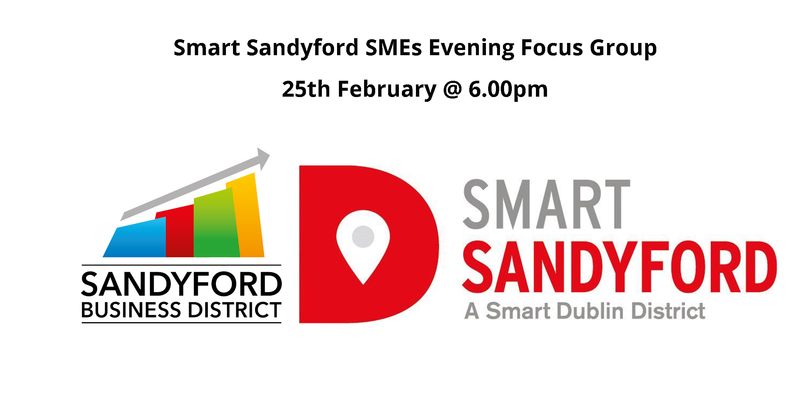 The workshop will be facilitated by members from the Sandyford Business District and Smart Sandyford teams.